Little One, God Made You Special by Amy Warren Hilliker is a children's book aimed at teaching toddlers that they are unique and divinely created by God. 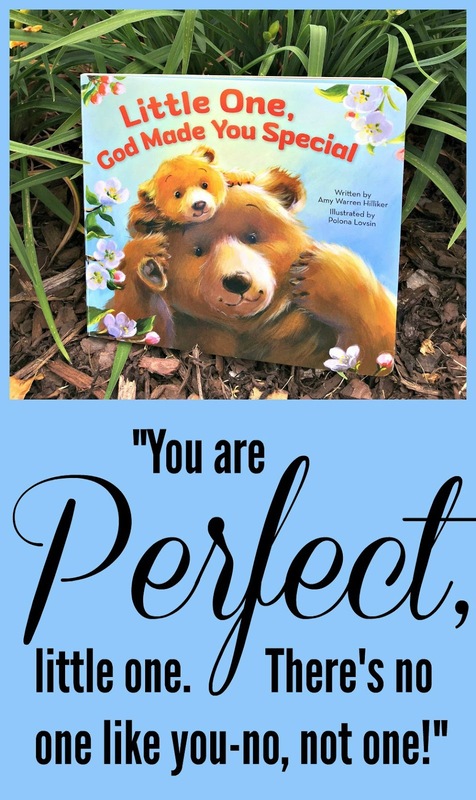 This rhythmic board book teaches youngsters that there is no one else in the world exactly like them and their individuality is part of Christ's plan. The illustrations throughout the book are soft and welcoming with cuddly animal pictures depicting the love between a parent and a child. There is a clear spiritual message, perfect for those who are learning about the love of Christ. As a parent who tries to reinforce a Christian education in our home with bedtime books, songs, and throughout my children's lives, I would recommend this book to other parents looking to teach their children similar values.